Congress enacted the Real Estate Settlement Procedures Act, commonly referred to as RESPA, to curb unethical practices and consumer abuse in real estate settlement charges. Before the law was enacted, consumers were subject to abuses by real estate professionals and closing service providers when it came to the costs they paid to close on their homes. There is not necessarily a problem if you have an ownership interest in a title company and refer business to that company. However, there are very clear rules for when and how you must disclose your relationship with the business to the consumer. You also cannot force a client to use a service simply because you have an ownership interest in it. As far as marketing relationships between service providers go, there are gray areas, so be careful. The fines are stiff, and some real estate professionals have lost their licenses due to violations of shared marketing rules. 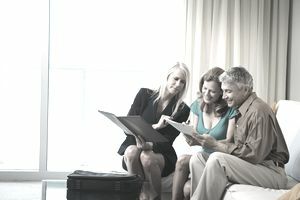 Real estate service providers, such as closing agents, can share ad space with real estate agents who pay their pro-rata share of the cost. Real estate service providers can provide handouts/promotional items bearing their logos to real estate agents. The items cannot bear the real estate agent or broker's logo. Service providers can co-op direct mail if the real estate agent pays her share of the cost. Service providers may attend open houses and promote their businesses only. These are just a few of the marketing areas that have been a problem for real estate brokers in the past. Business relationships can get complicated, so run any decisions about marketing or business referrals by an attorney knowledgeable about RESPA if you have any questions or concerns.